ASSA ABLOY Access Control and Gallagher Security have made the grade at Higher Education Expo, in presenting an integrated approach to access control. Held at London Olympia on 17th October 2013, ASSA ABLOY Access Control and Gallagher jointly showcased the latest state-of-the-art access control solutions and innovative new product releases, designed to enhance security in education. On display was the revolutionary Aperio wireless locking solution, designed to upgrade mechanically locked doors and wirelessly connect them online or offline to new or existing access control systems, with minimal modification to doors and premises. 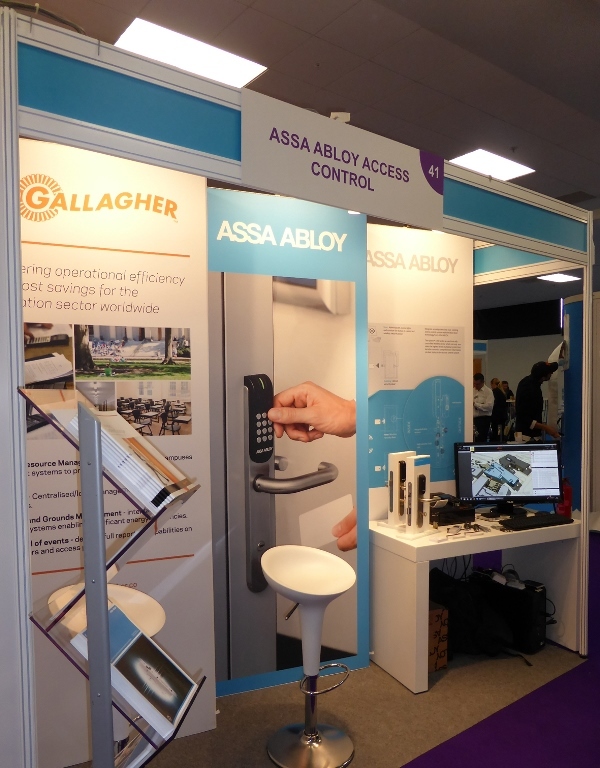 Visitors to the ASSA ABLOY and Gallagher stand were also able to experience the cylinder and escutcheon variants in the Aperio range, alongside the advanced new L100 platform, the worlds first wireless lock range for security doors with monitoring capability. Also proving popular was the Aperio PINpad escutcheon, where visitors could appreciate the extra level of access control for doors presented with multiple authentication capability, offering users the opportunity to enter a PIN of four to eight characters, or utilise a high security card reader, or a combination of both. Says Damian Marsh, Managing Director for ASSA ABLOY Access Control: Higher Education Expo has become an important highlight in the ASSA ABLOY Access Control calendar, to illustrate how we are listening to the audience and launching products to enhance security on site, without affecting carefully planned learning timetables. "Visitors to our stand could see that we understood the challenges faced by university security teams, including protection of staff, students and their high value equipment. Together with Gallagher, we presented a seamless access control solution and in utilising Aperio, offered a proven 'all in one' scaleable way to cost effectively upgrade the controllability and security level of any higher education facility."